Your new Corporate Card offers you an excellent range of benefits. Full details of your Card benefits plus your Insurance Documentation can be found in this welcome kit. With first-class service and support, we’re here to help remove the stress from travelling and make it more enjoyable. 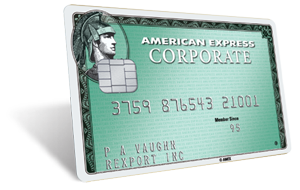 This website offers a comprehensive guide to using your Corporate Card. It also provides information on Travel Insurance and the Customer Services you can expect with your Card. In business, some things have to be dealt with there and then, wherever you are. That’s where your Card can help. From travel protection, to making dinner reservations after you’ve landed, the benefits that come with your Card can help you to manage it all, effortlessly. Sign the Card immediately, using a ballpoint pen. Keep the Card in a conspicuous place in your wallet, so you will notice if it is missing. When using the Card in any transaction, make sure that the Card you get back has your name on it. When making telephone bookings, such as hotel reservations, only disclose the Card details when making definite orders. Immediately destroy the Card if it has any incorrect spelling. No matter where you are or the time of the day, your Card provides you with a host of services and benefits to help make doing business easier. Your new Card provides you with a flexible and safe method of payment that helps meet the demanding requirements of the business traveller. When you travel on business with your Corporate Card, you can expect nothing less than exceptional service wherever you go. It gives you access to a great level of service, 24 hours a day, 365 days a year. Accepted at millions of locations globally, your Card enhances your travel experience, making it easier for you to do business around the world. Within this welcome kit, you’ll learn more about the exciting features and benefits of your Card. The welcome kit also provides information on Travel Benefits and the Customer Service you can expect with your Card. Please take a few moments to review the comprehensive list of benefits and services available with this membership. +44 (0) 1737 815 086 for assistance. Our Global Assist service does not charge you for making any of the necessary arrangements. Cash advances, medical, shipping and other costs are charged to your designated Corporate Card, therefore approval will be sought prior to incurring any costs. The Membership Rewards1 programme is the loyalty programme from American Express that rewards you for using your Corporate Card2. Once enrolled in the programme, you will earn one Membership Rewards point for every Euro or Dollar of eligible spend you charge to the Card3. These points can then be redeemed for flights, weekend breaks and various items or experiences. +44 (0) 1273 864 864. Enrolment is free for the first year and for an annual fee (currently US$/€36.00 inc VAT) thereafter. Please note that enrolment to the programme is subject to your company’s policy and approval. Should you ever need any help or advice while you’re away on business, we have over 2,200 American Express Travel Service offices4 in 140 countries globally, staffed by English speaking professionals. Having signed up to Online Account Management, stay in control of your business expenses with online access to your account. It’s the most convenient way to manage your account, whatever time zone you happen to be in. To access Online Account Management, simply visit americanexpress.co.uk/myaccount and log in using your User ID and Password. You will be able to set your login details when you first register your Card. With your Corporate Card, there is no pre-set limit on your spending unless your company sets one. Any Card that has a pre-set limit will be monitored to ensure this limit is not exceeded. For your protection, we may call you to confirm your identity if you make a purchase that seems outside of your normal spending pattern. If you anticipate making an out-of-pattern purchase, you can avoid a phone confirmation by contacting our Customer Service Team in advance. If your company participates in the Corporate Express Cash5 programme, you can use your Card to withdraw cash. To enrol, you should complete the Express Cash Enrolment Form. Your Programme Administrator can tell you whether your company participates in this programme and provide you with the Express Cash Enrolment Form if required. – US$/€350,000 if the accident occurs within 30 days of arrival on the outward travel leg (and prior to the return leg). The Amex Mobile app makes it easy for you to manage your Corporate Card account. You can view transactions, verify charges digitally, and make payments anytime, anywhere with an internet connection, if needed. Know where to stay, where to dine, what to do and how to get there with the American Express Corporate Travel Tips tool, which allows you to identify 1000’s of places frequented by Corporate Cardmembers globally. The Customer Service Centre is available 24 hours a day, 365 days a year. Always quote your Card number and, when writing, include copies of Records of Charge, Statements and other documentation that will help us to resolve any enquiries as quickly as possible. By using the Card, you will be accepting the Terms and Conditions applicable to the Card. A copy of the Terms and Conditions can be found here. Alternatively, please call our Customer Service Team at the number listed below for a copy of the Card Terms and Conditions. If you do not agree to them, you must not use the Card, please notify us on the number below, or cut the Card in half and dispose of it carefully. Please call +44 (0) 1273 868 900, 24 Hours a day, 7 Days a week. 1. Membership Rewards Terms and Conditions apply and can be found on the American Express website here. 2. The availability of the Membership Rewards programme is subject to local laws and regulations. Membership Rewards is available for all companies unless they choose not to participate in the programme. 3. Membership Rewards points are not earned on Balance Transfers, Cash Advances, American Express Travellers’ Cheques purchases, Foreign Exchange transactions, interest, fees, loading of pre-paid cards, and any amounts that are subsequently credited to your Card Account by way of refunds. 4. American Express Travel Service offices comprises a Travel and Foreign Exchange Service location of American Express. Not all services are available at all locations. 5. Please note that Express Cash application is subject to approval and application (Terms and Conditions apply). Cash access is granted subject to and governed by the terms of the agreement between American Express and your Company and may be withdrawn at your Company’s request at any time. Please be aware that limits and fees apply. Each time you make an Express Cash transaction a charge will apply of 4% of the value withdrawn or a minimum charge of US$/€10 will apply. Visit amexnetwork.com/atmfinder to find your nearest cashpoint. 6. Business Travel Inconvenience Benefits Terms and Conditions apply. Full details of the travel benefits currently available can be found in the Travel Protection Benefits booklet on the American Express website here. American Express Services Europe Limited (AESEL) is authorised in the United Kingdom by the Financial Conduct Authority under the Payment Services Regulations 2009 (reference number 415532) for the provision of payment services. Registered in England and Wales with company number 1833139 at: Belgrave House, 76 Buckingham Palace Road, London SW1W 9AX, United Kingdom. AESEL is, for insurance mediation activities only, an Appointed Representative of American Express Insurance Services Europe Limited (reference number 311684) who is authorised and regulated by the Financial Conduct Authority. Details can be found on the Financial Services. Register by visiting www.fca.org.uk/register or by contacting the FCA on 0800 111 6768. Please be aware that for American Express products issued in the UK and obtained within the European Economic Area, the conduct of business activities will be regulated by that country’s insurance regulator.